One day after everyone was talking about the significance behind the green dress Melania Trump wore to meet Queen Raina of Jordan, headlines are shifting to the outfit in which she hosted China's first lady on Thursday. She and President Trump held a formal dinner for Chinese President Xi Jinping and Madame Peng Liyuan at Mar-a-Lago -- a resort Trump owns in Palm Beach, Florida. SEE ALSO: Will Camilla Parker Bowles get the title of Queen? 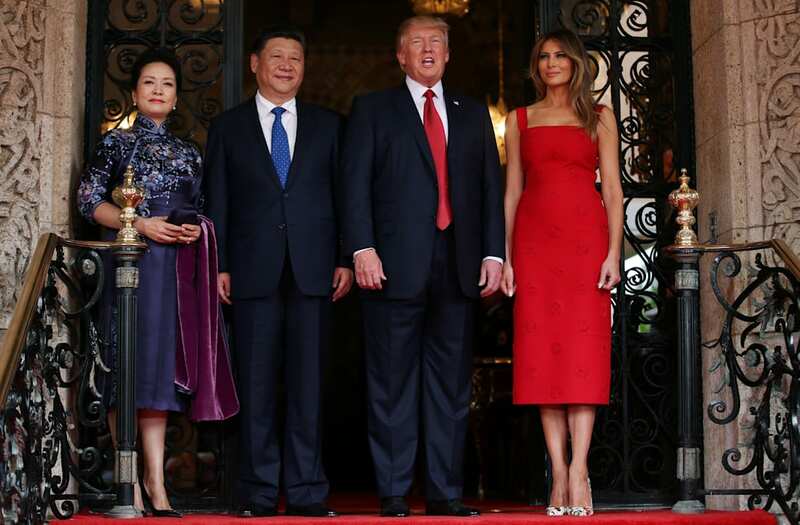 Continuing her pattern of diplomatic nods, FLOTUS donned a $5,500 red Valentino dress for the occasion (it's on sale for $4,000 here), in a tribute to China. She's not the first to turn to the color when greeting Chinese officials. Duchess Kate Middleton wore a red Jenny Packham dress when she and Prince William met the Chinese president and first lady in 2015, and Michelle Obama met President Hu Jintao in a red Alexander McQueen number in 2011. Melania paired her Daisy appliqué frock with a pair of patterned So Kate Christian Louboutins -- and there's a reason why we can see them so clearly. If you take a closer peek at the original dress below and compare it to the first lady's in the photos above, you'll notice that Melania's is a bit shorter. While she may receive backlash for the move, with some potentially criticizing her for showing more skin, we're not complaining that she gave those pumps room to breathe. They're gorgeous and deserve to be seen -- and the subtle alteration does little to make the Valentino number any less elegant.